Experts are now predicting that our Lifetime cancer risk is going to be 1 in 2 by 2020 – a mere 10 years away. In fact, it is one in three already and top nutritionist and author Patrick Holford believes that most of this risk is completely avoidable by simple changes to both diet and lifestyle factors which expose us to a plethora of carcinogens, which promote cancer cells and also suppress the immune system. It may be comforting to believe that great strides are being made in cancer treatment, but Holford believes that nothing substantial has changed. According to the Journal of the American Medical Association, there has been less than a 1% decrease in the rate of new cancer diagnosis and neither the death rate nor the incidence of new cases has changed. d) Diet and lifestyle habits that strengthen immunity – from vitamin D and sunlight exposure to eating berries and upping antioxidants. If a person has cancer, or early-stage cancer risk, these prevention factors have to be applied aggressively, not just as advice to ‘eat a well balanced diet’. There have been in reality no substantial change in cancer treatment and although surgical procedures have slightly improved they don’t actually address the underlying cause. 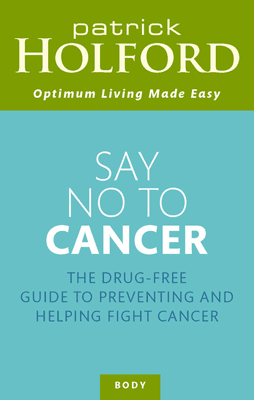 In his new book ‘Say No to Cancer’ Holford outlines the real strides that have been made in nutrition-based anti-cancer strategies that both kill cancer cells and boost immunity, rather than weaken it, as does chemotherapy and radiation. He discusses two of the most promising treatments which are intravenous and/or megadose vitamin C and salvestrols, both of which show promise. Everyone knows that eating fruits and vegetables is good for your health. Conventional medical advice is to eat at least five portions a day and evidence shows that a diet rich in plant-based foods helps to combat many diseases, especially cancer. What is now becoming clear is that there is more than one single mechanism whereby plants are able to help prevent and reverse the cancer process. A dedicated team of research scientists in Leicester believe that a key component, and a mechanism, in plants could be a major breakthrough in both cancer prevention and treatment. They believe that salvestrols, naturally occurring compounds in certain plants, can help to explain how plants offer a treatment for cancer with fewer side effects than conventional treatments. Salvestrols are a group of naturally-occurring plant compounds present in certain fruits and vegetables, they contain substances which can be changed by an enzyme, present in both pre-cancerous and cancerous cells, to produce a toxic chemical which brings about ‘cell death’ (apoptosis) and therefore destroys the cancer cells. He had written a previous version of this book, but Patrick Holford found that in the last decade there has been so much positive research showing how to make yourself cancer-proof that he has completely rewritten Say No to Cancer, to more than double the size, and is doing a nationwide tour, both in the UK and Ireland, to help you learn the simple tricks to boosting your body’s own defences against cancer, and also infections, and how to stack all the odds in your favour to never get cancer.